I got a little crazy in the baking department this weekend. There was a baby shower for a good friend of mine planned (god bless her precious little socks) and I got myself up to my elbows in cake for the occasion. I thought, momentarily, about making the ever-appreciated chocolate cake, a safe bet for people whose tastes you don’t quite know. And I thought about a Victoria Sponge too for it’s crowd pleasing qualities. And then I thought about the friend whose baby we were showering and about how I just know, deep down, that these good folks would want their precious bebe well versed in the language of foods, various, exotic and experimental, and I knew I had to offer a few flavours not always found on a party board. Now, if you haven’t already met her and found out for yourself, there really is only one place to go for inspiration for a splendid, voluptuous, mouth-watering Bake of some kind. Dear Debs at Smitten Kitchen has the trump up her sleeve every time. Having scoured the ends of the earth and the bottom of every food magazine pile and waded her way through a sea of recipes she finds the best, the most sumptuous, simple the most mouth-wateringly delicious cakes out there. This time, after an hour or so having to dab delicately at my mouth to keep my salivations from the keyboard I found a masterpiece of baking: a Pistachio Petit Four cake. My dear friend, Ms A, is of a Persian bend and I thought that the pistachio, apricot and almond trio were a perfect tribute. Having overwhelmed my senses at Deb’s place, I thought I’d leave some space for some other inspiration and dawdled over to Bea’s at La Tartine Gourmand. Bea has an ability to wave her magic French wand over everything she does and give it that certain je ne sais quoi. I fell in love, instantly, with her Lemon Yogurt cake for a few reasons, not least of which was that it was her dad’s favourite. I’m a bit of a dad-o-phile myself here and it tugged somewhat on my homesick/family-sick heartstrings. Also, it’s kind of like a cheese cake, but much lighter and it comes in a pastry. Pastry? I’m in! For the third plate I stayed a little closer to home. I did a gorgeous walnut banana bread, which I sliced in half through the body, scooped a little bit out of the bottom half and filled with dulce de leche. So there you go, ma petite belle bebe S: something from your home, something from my home and something half way between the two. May your life be beautiful and delicious. Okay, I promise that this is the last catch-up-on-summer post I’ll put out here. It’s nearly December, for goodness sake, and I’ve a plethora of Autumn cooking to catch you up on and I really don’t want this to end in the Summer next with me still waffling on about Christmas baking. But how, I ask you with cake in my mouth, could I not tell you all about this? Look at it, don’t you just want a piece? And, to be honest, with the November rain-snow-yuck glooming down all around us at the moment a little bit of sunny coloured apricotiness can’t do too much harm. 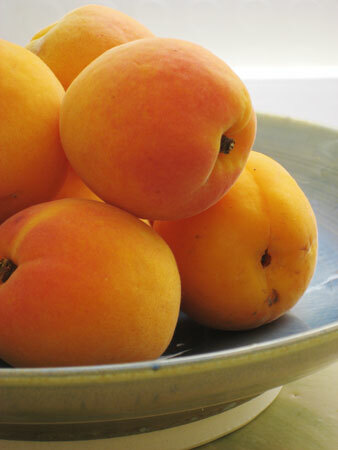 Apricots are something I actually seldom buy, perhaps only once in the season. The reason is that they are such a sensitive, delicate little fruit that by the time they get from the tree to the store they always seem to have lost their lovely, translucent glow and their flesh turns to powderiness or mush far quicker than is convenient. Growing up in South Africa meant, among other things, having access to very fresh, delicious fruit and I can’t help but compare the apricots I’ve bought here with the firmer, juicier ones I remember from childhood. Nonetheless, there are times when, luck in hand, I run into a crop of apricots so blushing, so sunny and full of optimism that I simply Must Have Them. This particular lot were simply lovely, a rare treat in a rainy summer. And having bought far more than I knew we’d manage to eat before they tipped over on to the other side of ripe I knew the best way to use them up would be in a tart. 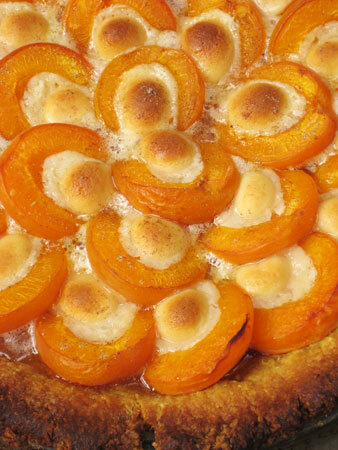 I thought a great compliment to the tartness of the apricots would be the delicate fragrance and flavour of almonds I achieved this not only by using almond flour in the pastry, but also by fashioning new stones for the halved fruit out of marzipan. It not only looked quite precious, it tasted, let me tell you, Delicious. – mix all three fours and the sugar, tumeric and salt. – add the water and combine to form a dough. 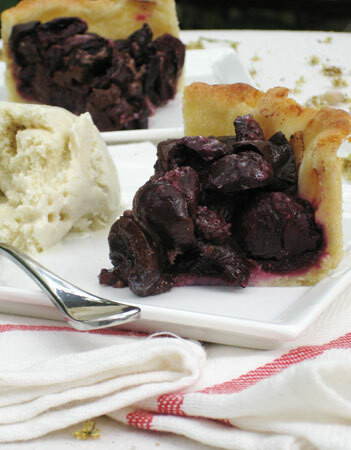 – roll out the pastry and line a greased pie dish with it, trimming the edges. 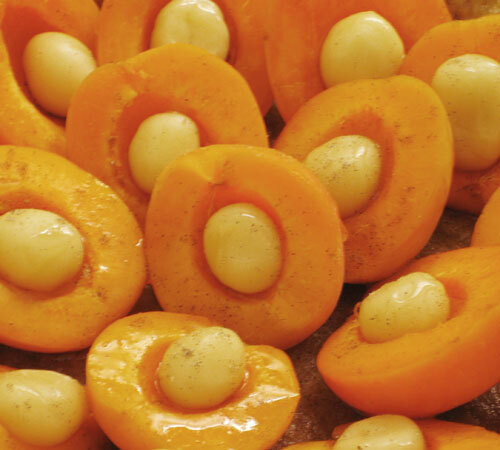 – pinch of marble size pieces of marzipan, roll between your palms to form a ball and place in the centre of each apricot. 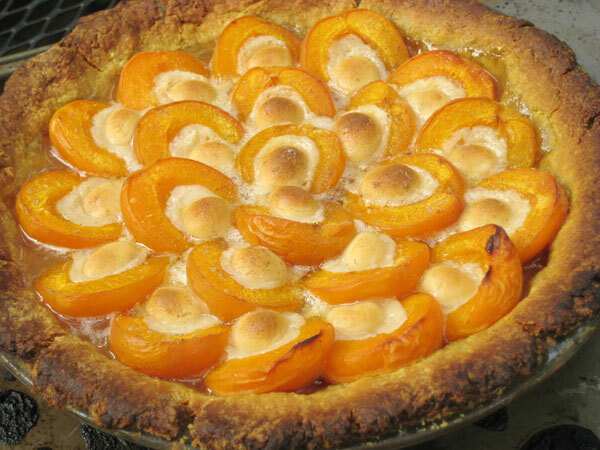 – warm the hone a little over a low heat, add the cardamom and drizzle over the apricots. 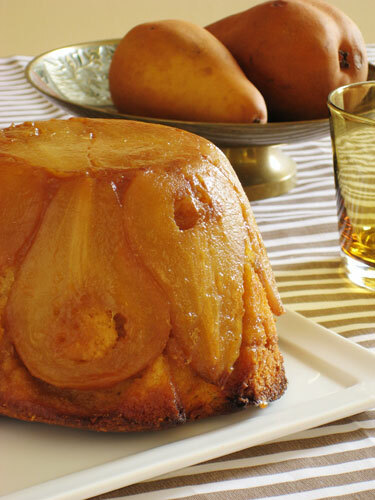 – Bake for about 35 mins until the pastry is golden and the liquid from the fruit and honey is bubbling. Oh, don’t shoot me. Another recipe I diligently wrote down while making and have since misplaced somewhere in the maelstrom of my kitchen notes over the last few months. Listen, people, do as I say and not as I do. If you’re going to be making up recipes and fabricate wonderful new concoctions in the kitchen, keep a whole notebook, bound and sturdy and without loose pages in which to write said culinary experiments. Do not, as I do, keep a post-it pad in the cutlery drawer on which to scribble, somewhat illegibly and often covered in some un-named sauce, your moments of cuisinary Eureka. So bear with me here as I try to back track in my mind and remember what went into this little morsel of yumminess you see before you. The shell, I remember well, is a simple shortcrust. No difficulty there. If you need a recipe, this is a good one, but make only half the required amount as you don’t need a lid for this pie. 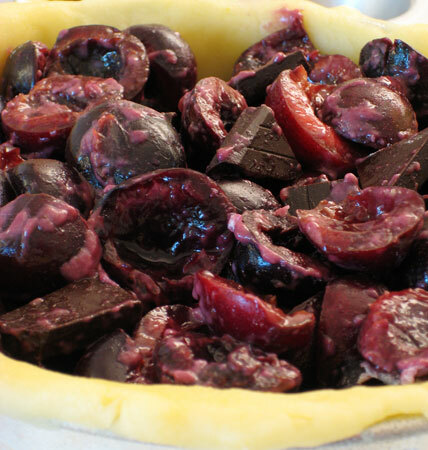 The filling was a pint, at least, of dark, almost black, Bing cherries; pitted and halved, or halved and pitted whichever order you like to do that in. Next would have been a little bit of flour and a little bit of sugar. Again, I can’t give you exact measurements, but I’d estimate ⅓cup sugar and a ¼cup plain flour. Then a generous amount of dark chocolate, cut into chunks. Hmmm. Lets guess at 100g, 70% cocoa. Of course, the rest seems fairly simple. Preheat the oven to, oh, 375˚F. Line a springform cake tin with the pastry and chill in the fridge for 10 mins. Fill the shell with the cherry/chocolate mix and bake for about 30 mins, or until the pastry is turning a golden brown and the filling is bubbling merrily away. Chill for about 10 mins outside the oven before removing from the springform. Brilliant eaten still warm with a good dollop of vanilla ice-cream. Good luck! And please, if anyone can see a major blup in my thinking here, shout shout shout. No, you are not imagining things and I have neither moved to the Southern Hemisphere, where peaches are undoubtedly about to come into a gorgeous new season, nor have I lost my love for all things seasonal. This is merely another of my catch up posts for the recipe’s I never got around to posting over the Summer here in Toronto. At the St Lawrence Market there is a produce stall on the upper level where, from the end of June, you can see people poking there noses around, lowering their glasses to read the hand written signs on the fruit displays, sighing a little, disappointed, and carrying on with their shopping. They’re waiting, you see, for The Peaches. The Peaches I speak of are no ordinary peaches. Ontario abounds with peaches from it’s Niagara Region through the Summer, but this little, owner run stall in the market has found peaches of such good, consistent quality that they have people asking for them specifically. And when the famous Peaches do eventually arrive, in baskets and boxes, they are pounced upon (gently, of course, to avoid any bruising) and bought in hoards. People can be seen leaving the market, one hand weighed down by pounds and pounds of peaches, the other delicately eating a fresh, ripe peach right on the spot, juice running down their chins and a happy, far away glint in their eyes. What to do with such peaches? They seem to lovely to be turned into sticky jams and are far best eaten just like that, with the aforementioned juices running down the chin. But sometimes one likes to, uh, tart a peach up a little, if you know what I mean. This is a great way to make the best of the season’s hero’s while delivering a dessert that smacks just enough of glamour and decadence. One of the best things about serving fruit for dessert is it’s ease of preparation and this little gem is pretty darn simple. Other than a little whipping for the meringue and a little stirring of the custard there’s really not much to making this. I must add here that I’m using the word “Custard” rather loosely since there’s neither milk nor cream in the mix. But it turns out so creamy and velvety in any case that I couldn’t think of anything else to call it. *note: I baked this for two, hence the 1 large peach, halved. Multiply for more people. Also, I know it’s not always that easy to get great quality juice in North America. I use Ceres fruit juices from South Africa, available all over the place here, but alternatively you could juice a fresh peach. 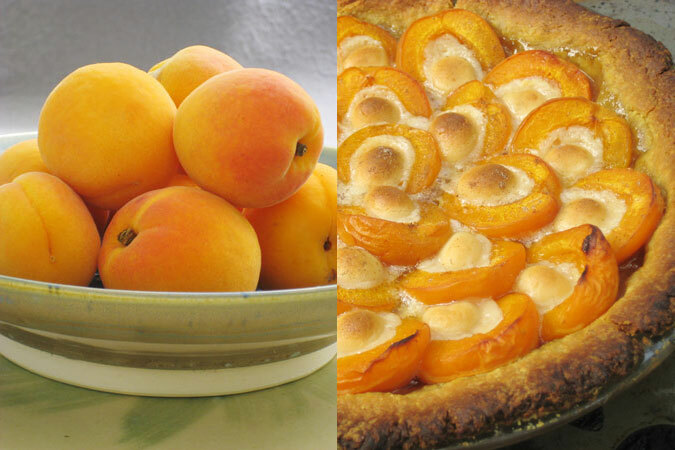 – Place the peaches, cut side up, on a baking tray. Sprinkle the vanilla sugar and balsamic vinegar over them. – Whip the egg white untill stiff, then add the sugar 1 Tablespoon at a time, beating between each addition. 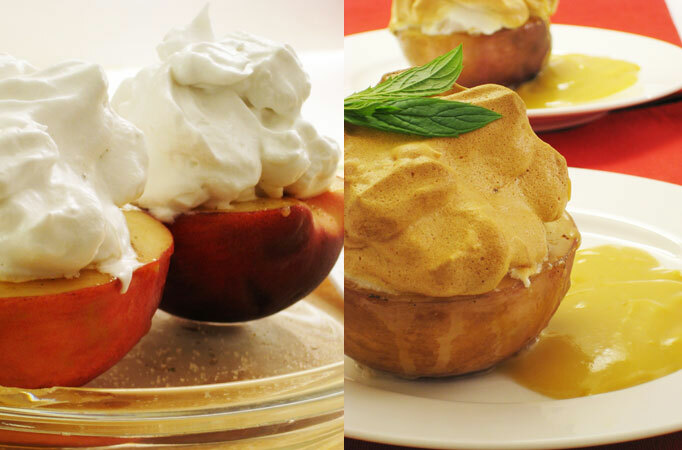 – Top each peach with the meringue mixture. Bake in the 300˚F oven for 25 mins, then lower the temperature to 250˚F and bake for a further 10 mins. – To make the custard, stir the corn starch into the cool peach juice. Add the yolk, vanilla and salt and mix well. – Over a moderately low heat, stir the peach custard untill it thickens and coats the back of a wooden spoon. 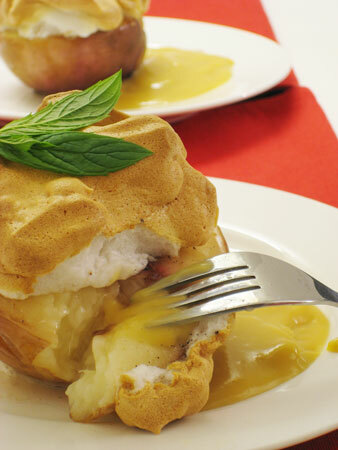 – Before serving, stir the butter into the warm custard until melted. Okay. I’m sorry for the awful pun. Although, I know that once you taste this scrumptious little mound of deliciousness you’ll forgive me in an instant. I’ve been holding on to this little gem for a while now, not because I didn’t want to share, but because it somehow, as things occasionally do in the manic digital mayhem that can be our lives, got lost in the ether, so to speak. Having finally surfaced from wherever it is that pear puddings go to holiday, I’m finally getting around to sharing it. This pudding seemed to be thwarted at so many points in it’s short life at it’s time in the lime light. Having been originally made to appear as a piece de resistance at the end of one of more decadent dinners the ever fabulous Mr P and I hosted, it was politely refused it’s place of glory when a second dessert appeared, as if by magic, in the hands of one of our guests. Not having been the first time a guest has brought a dessert to the table (and let me tell you, what a dessert it was! A pear pudding knows when to gracefully bow out to superior forces) I was well versed at organising a suitable Sunday Tea for the consumption of said pudding. However, a pear pudding’s prime not being as long as Madonna’s, a new set of Tea Guests were sadly disappointed with a somewhat dry, if tasty, bit of pud. Not to be out done, Pear Pudding was dutifully recreated to it’s original glory and enjoyed by all. I love a happy ending, don’t you? Having the visual idea in my head of what I wanted my pear pudding to look like, but no recipe to follow or adapt, I did the next best thing and combined a couple of different recipe’s. I used the basics from a Women’s Weekly Pear Tart Tatin (from their New French Food cookbook) to caramelise the pears and a basic pudding recipe for the rest (thanks grandma). Best served with clotted cream. 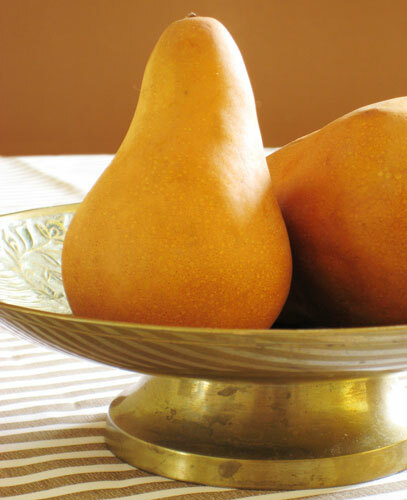 – slice the pears length ways into 1cm (½”) wide slices, keeping their peary shape. Keep the middle, pear shaped slices whole and chop the remaining bits into cubes. You need about 10 of the pear shaped slices for the sides of the pudding basin. – heat the butter, sugar and cream slowly in a large, heavy based saucepan, stirring until the sugar is dissolved. Add the pear slices and chopped bits to the caramel and bring to the boil. – simmer over a low heat, turning the pears every so often, for about 25 minutes, until the pears are tender. 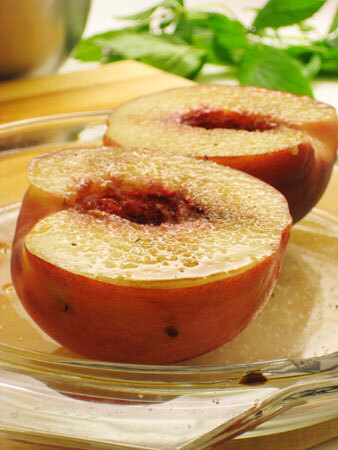 Remove from heat, drain pears from caramel, reserving sauce. – for the batter, beat the butter and sugar until creamy. – beat in the eggs, one at a time. – sift together the flour, baking powder and cinnamon. Add to the egg mixture and mix until just incorporated. – coat the pears in half the reserved caramel. – fill the basin with pudding mixture and top with the rest of the caramel sauce. – bake in the middle of the oven for 25 to 35 minutes (checking often after 25 mins) until set in the middle. You know the saying, “when life gives you lemons, make lemon aide”, well my philosophy in life runs in the same vein: When the banana’s of your life turn black, make banana bread.” Which is my way of saying, when life’s being a little rough with you, eat cake. Also, it ties in rather neatly with my Waste-not-want-not upbringing. For a change, however, it being The Season of Great Changes and all, I eschewed all things expected and made something a little crazier. When asked to provide, and I quote, A Simple, No Fuss (with a pointed raised eyebrow, Ms Vickers) Dessert for an evening of screaming and gasping over the new series of Battlestar Galactica, what better remedy to such an unnatural request than brownies; and with those last two, very black banana’s staring at me from the bottom of the dusty fruit bowl, what else could I do but provide Banana Chocolate Brownies? These turned out to be a bit drier than my normal brownie recipe, which I usually diligently obey Nigella’s instruction on, but that made them just perfect with a big, yummy scoop of banana ice-cream. 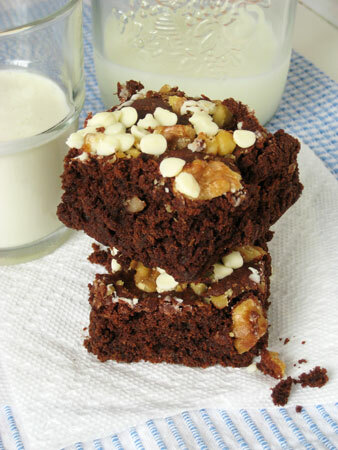 *note: I put a cup of walnuts on top of the mixture before baking to make a walnut-like crust, but go ahead and mix them into the batter before baking. Ditto with the white choc chips, or go super wild and use dark choc chips for extra punch. -in a heavy bottomed saucepan, melt chocolate and butter. Let cool a bit, then whisk in the sugar. 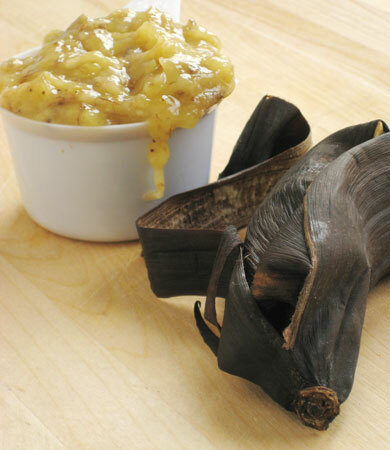 – in a separate bowl, whisk the eggs with the banana and vanilla. Add to the chocolate mix. – whisk together the flour, baking powder and salt, sift into chocolate and mix well. 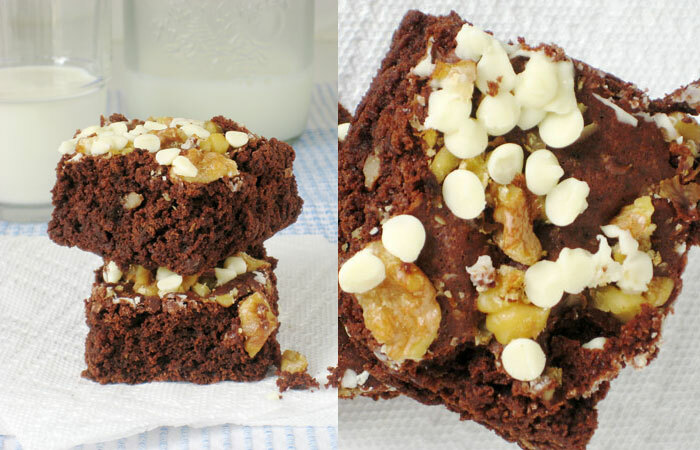 – scraped into baking tin, top with nuts. – bake for about 30 mins until set in the middle. Remove from oven, top with white chocolate chips and allow to cool for about 10 minutes before cutting.